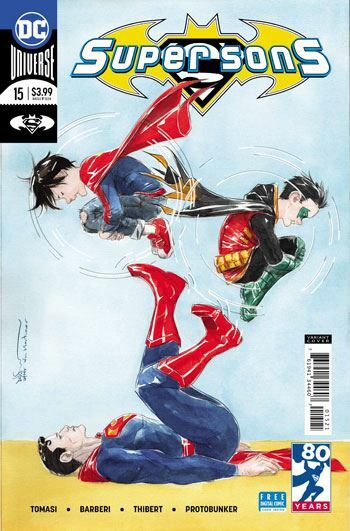 Tomasi and Barberi bring back Kid Amazo for a second round against the Super Sons, though the villain is not quite what he seems to be. It’s sadly appropriate, as the book is getting cancelled with the next issue, the conclusion of this two part story. Kid Amazo was the first villain that they fought, so it brings the series full circle. I already know I will really miss this book, and I highly recommend everyone pick it up. Tomasi has excelled, in each and every issue, with his snappy dialogue. Robin and Superboy make such a great comedic action duo under his pen. Or cursor. Or whatever. Barberi and Thibert give the story a great look, just stylized enough to be effective. I have enjoyed every issue of this book, and though I am sad to see it go, this story is setting up a grand finale in the next issue. Superman and Batman have been frequent supporting characters, but this time around the entire Justice League get involved. It’s a challenge to keep the fun going when everything around is coming to an end. This week’s issue of Superman is particularly mournful and bittersweet. Tomasi is avoiding this mood as much as possible, and I am glad. 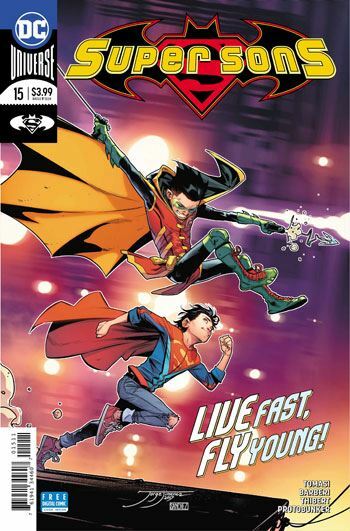 Super Sons has been an entertaining and free-wheeling book from the get-go, and the sense of wild adventure remains, no matter how dangerous the villain they face. A strong and fun story, setting up what looks to be a great finale.